Team Jefferson Starship reviewed this attraction on October 27, 2016. 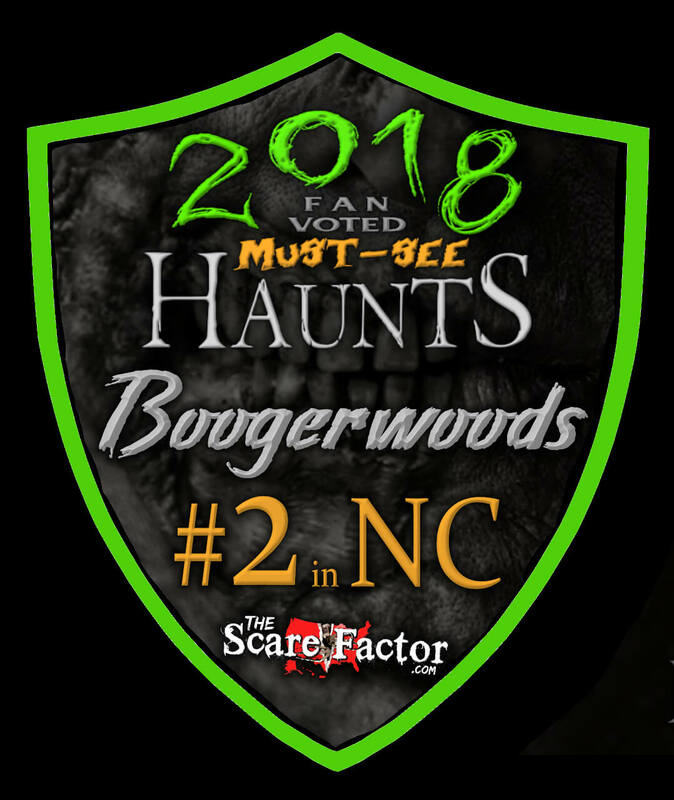 Boogerwoods is a haunt in eastern North Carolina that all haunt enthusiasts should visit at least once. 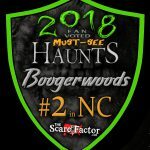 A charity haunt that donates its proceeds to combat cystic fibrosis, Boogerwoods is packed with a number of scenes, a ton of volunteers, and a mix of scares, humor and special effects that deserve to be seen. This isn’t a high budget, professional haunt run by a business but a huge group of people who have a lot of passion for what they do and a need to show it off to everyone. Visitors are lead through Boogerwoods by a pair of guides – usually one at the front of the group and one at the back – who work in tandem to provide some running commentary, introductions, and keep the groups moving from one scene to the next. One immediate result of this is that each time you visit, you may have a slightly different experience because of different guides and their banter and dialogue. A lot of the interaction occurs between the visitors and the guides with the Boogers in each scene mainly interacting with the guides or chasing screaming guests out of their hidey-holes. There are about 100 volunteers working as haunters across a little over a dozen different scenes and locations, plus the pairs of guides who take you from place to place. Given the volume of volunteers, the dedication of each of them to remaining in character and working, sometimes very, very physically, to provide scares is a testament to how much Boogerwoods loves what they do. Given that there are so many actors across the site, there were instances where the makeup or masks were not quite 100%. The good news is that most of the Boogers who are interacting directly with visitors are given a bit more time and care. The Booger behind the counter at the Small Engine Repair Shop for example was very well done as were the classic horror movie figures (Freddy, Jason, Michael Myers) for the amazing Flatback scene. We want to make sure our readers understand that the staff of Boogerwoods are great. They are friendly, helpful and willing to answer questions. One must understand that as you move from scene to scene you are traveling through Carolina woods. Dirt, uneven ground, tree roots and even loose soil are all going to be encountered. However, this is also the case inside some of the scenes as well. Entrances into and out of some scenes include steps up or down; be careful and watch your step, or ask the guides for help (they have flashlights). You will be warned before the Haunt begins that pregnant women, those with motion sickness, people who have issues with tight spaces, or with strobe lights may want to avoid some scenes – the guides will provide a way around any given scene if these apply to you. For some scenes, you can anticipate what these hazards might be – strobe lights in the dance club or clown school, heavy motion in the tornado scene or earthquake shelter. Some of these effects are very extreme; one of our reviewers who has experienced several earthquakes attested to the realism of the scene at Boogerwoods. In short, while the staff know where to put the guests to avoid the greatest danger, there are chances where you may bump heavily into a wall or against props. Then there are the lines. Boogerwoods has been in operation for 39 years. They deliver an amazing experience and the lines speak of this. Your choices are to get there early (ticket sales start at 2pm), buy a fast pass (scheduled and staggered every 30 min throughout the night), or wait in line. The line can easily last upwards of two hours on a crowded night. There is some queue entertainment in the form of a projected video/movie and/or music being played, but little else. We highly recommend doing what you can to avoid the line. The outside of Boogerwoods seems rather underwhelming and has a jovial, campy feel to it. Don’t let that dissuade you or detract from what you are about to experience inside though! There was some bleed over sounds from deep within the haunt consisting of bangs, roaring chainsaws, and screaming visitors. A lot of those screams are well deserved; the entertainment provided by the Boogers is waiting! Beyond the witty banter of the guides and the sheer number of Boogers haunting the site, special effects are where Boogerwoods really shines. There are the standard chainsaw wielding maniac scenes and 3-D and blacklight paint splattered rooms (with and without clowns) that you can find almost anywhere. There are some sound effects, but not a lot of background or ambient noise. However, there are some scenes that you simply must experience in person – the mineshaft/flatback, the tornado room, and the earthquake shelter for example – are astounding pieces of mechanics, set design, and interactivity that you don’t see in other haunts. In the South, a booger is another word for a ghost; similar to bogey (as in the bogeyman), it is a sort of ambiguous term for unseen and indistinct monsters that induced psychosomatic fear in their victims. Boogerwoods, therefore, is a section of woods haunted by such creatures. As such, all of the various scenes at Boogerwoods have ‘booger’ somewhere in their name. Otherwise, many of the scenes are standard, old-school haunted house fare and Boogerwoods does its best to stick to those old-school themes that are standards in the industry. It can almost be a little game to try to piece together the ‘booger’ for a given scene – from the BW Gas and Grill (BW for BoogerWoods) to Uncle Booger’s Clown School to the BoogerCinema. Many of the rooms and scenes are built large enough that the boogers come at the entire group. Instead of just one actor jumping out at the front of a line of guests, at Boogerwoods you’re going to have multiple boogers popping out to rush at the guests or you’ll find yourself along a wall while a booger pops out of the middle to terrorize everyone around them. There are some creative uses of props. Visitors go through in groups of eight to ten and for the most part this is fine because of the way that Boogerwoods is set up; the guides get the whole group involved, sometimes moving different people to the front, sometimes rearranging their own place in the group, positioning visitors in the best place for scares. However, there were some instances where fewer guests would have resulted in better scares but perhaps that’s us being greedy for the amazing work the boogers do. While some parts of Boogerwoods may not be scary, there is a lot of entertainment going on. You may find yourself alternately biting back screams and letting loose howls of laughter! Boogerwoods takes about 50 minutes from your start in the Holding Tank until your eventual exit. However, Boogerwoods only costs $15 per person ($25 for fast pass). That comes out to 3.33 minutes of scares per dollar spent which is an amazing deal (and the highest out of the 80+ haunts reviewed by The Scare Factor so far this season). While we may have wished for smaller groups with each set of guides and recommend buying a fast pass to avoid the long lines, do not fear that you will not be entertained and get a great value for your dollar at Boogerwoods. Also remember that their proceeds go to charity, so while you’re laughing, screaming, ducking, and clinging to your fellow visitors, you’re also helping this huge group of volunteers do some good in the world!